One of the projects we have been involved with for several years is the ongoing masonry conservation of Soldiers’ Tower, a monument built just to the west of University of Toronto’s Hart House. 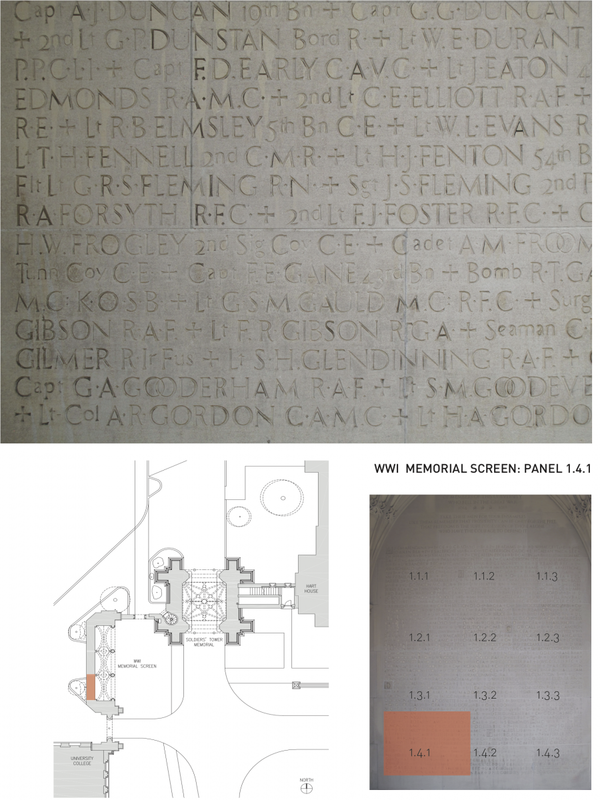 An interesting aspect of the project has been to catalogue and document hundreds of lines of engraved text on several stone faces within and adjacent to the Tower. The Tower began construction in 1919 and was designed by Sproatt & Rolph Architects. Funded through donations raised by the University’s Alumni Association and benefactor Vincent Massey, the Tower was completed in 1924. It is a solid stone masonry structure designed in the Late Gothic Revival style and built to honour members of the University of Toronto who lost their lives in World War I. Additional names where later added in the archway after World War II. While the Tower, which stands 143 feet tall, is architecturally significant in its own right, the carefully cut engravings, which list the names of 1185 fallen members, are arguably the most important element. So when members of the Soldiers’ Tower Alumni Committee told us that the names had never been recorded, we took the opportunity to do so. What ensued was a process of ladder climbing, photo-documentation, and numerous careful measurements assembled in a graphic catalogue identifying the content, form, location, and dimensions of each line of engraving. Having been through this process, we now see the monument not only as a record of our collective past, but also as a carefully constructed work of art. Its typesetting and engraving are artfully conceived and finely crafted, while its scale and grandeur convey with appropriate weight the loss of life in war. A page from the catalogue of documentary photographs. For information on Soldiers’ Tower and its annual remembrance service, please see University of Toronto’s Soldiers’ Tower webpage. For images and information on ERA’s work with Soldiers’ Tower, please see our portfolio page.